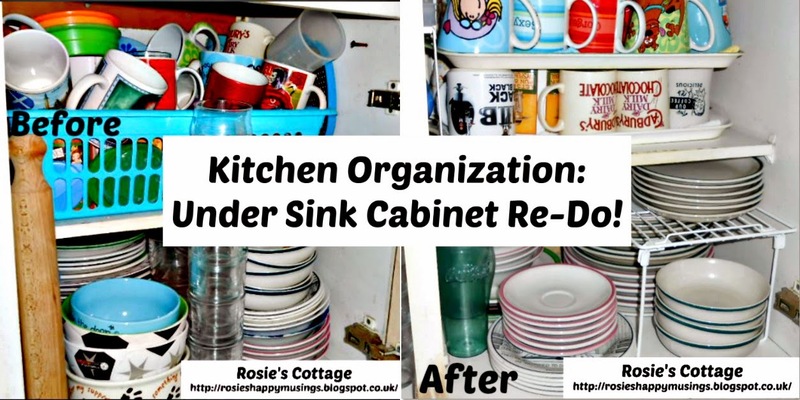 Rosie's Cottage: Undersink Cabinet Organization! Back with another little organizing project. So we finished the tiny little mudroom/entryway at the front door and the mail sorting system (and printable) for the hallway and most recently we completed organizing our lower hall. What is it about cabinets/cupboards that makes them gather clutter? Is "out of sight, out of mind" to blame? Or is it, with busy lives spent constantly trying to keep up with our schedules, that on very busy days, we feel we've achieved our goal by making our homes look tidy & presentable if guests arrive unexpectedly? We'd all love for our entire homes to be hospital clean and Ikea organized every minute of every day, but what if you wake up every morning already feeling like your schedule is already running away from you. Too much to do and not nearly enough hours in the day to do it. Well, sometimes tidy is great too :) My hope is that eventually everything we have in our home will have a place it belongs and so there should be no need to chuck things into cupboards in an effort to tidy up. So, on to the ghastly photos of my under sink cabinets and the horrors therein :) This is the left hand side of the cabinet, directly under the sink. <sighs> too much stuff just thrown in there, probably to tidy my worktops. 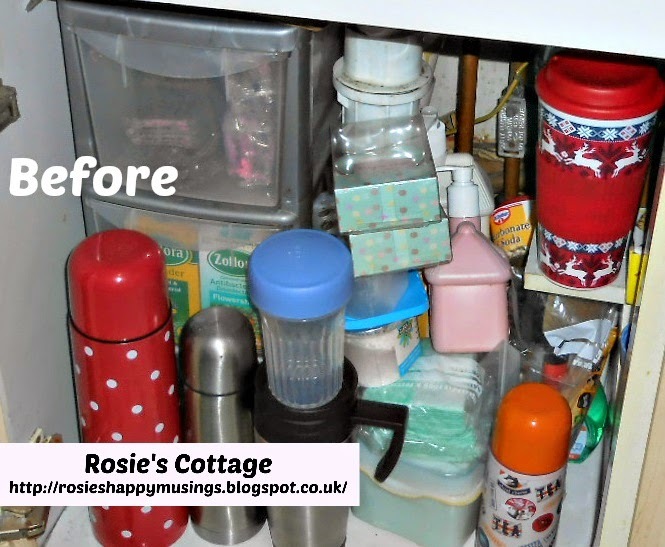 One great purchase I made a while ago is the little grey plastic set of drawers you can just about see behind the flasks & travel mugs :) This little set of drawers is marvellous, holds so much and sits so neatly under the sink. More of that later though. Also in this drawer, you can just see the package at the side, is something called "fat traps" I bought from Betterware a while ago. Quite a clever idea, they address the problem of what to do with the old cooking oil when you change the oil over in your deep fat fryer. With these you just wait till oil is cooled and then drop in one or two of these little pads which then soak up the oil. The pads can then be disposed of in your rubbish bin. Drawer two: as you can see from the photo is where I keep my bottles of Zoflora disinfectant. This little drawer holds over a dozen bottles. I can't help it, I'm obsessed with these little bottles of floral disinfectant, it smells fabulous and has so many uses. My favourites include Lavender & Rose, but my go to scent is the flowershop variety. Daft thing to be happy about but I swear they just fill me with joy :) Just a tiny, tiny capful mixed with the water in the steam mop before running it over my floors makes the whole house smell heavenly :) NOTE: do check your steam mop manual before trying this, ours is a little Pifco model and it works fine but do check, ok? Drawer three: This is where I keep my anti-bacterial wipes. The other little lilac box you can see in the drawer is a whitener for lace & net curtains etc. I have a beautiful vintage lace bedspread that I adore and (very carefully) use this occasionally to launder it. As I said this little set of drawers is so useful & the perfect size for that space. We bought this one from a store called Home Bargains for less that £5, it's also available at Asda, and probably lots of other places too. So, back to our "after" photo. Sitting on top of the set of drawers are spare coasters, and spare candle light bulbs for our fire in the Living room. At the side of the drawers are just a couple of cleaning products I like to keep by the sink, although most of my cleaning products live in a cupboard by our back door, and the washing up liquid lives on the window ledge in front of the sink. So, what do you think honeys? I'm trying desperately to eliminate clutter one cupboard at a time :) Do let me know what you think in the comments section below, I'd love to hear any hints or tips you might have for organizing cabinets. It's onto my tall larder cabinet next I think, which I already had an attempt at organizing a while ago, I'm not really happy with it though.